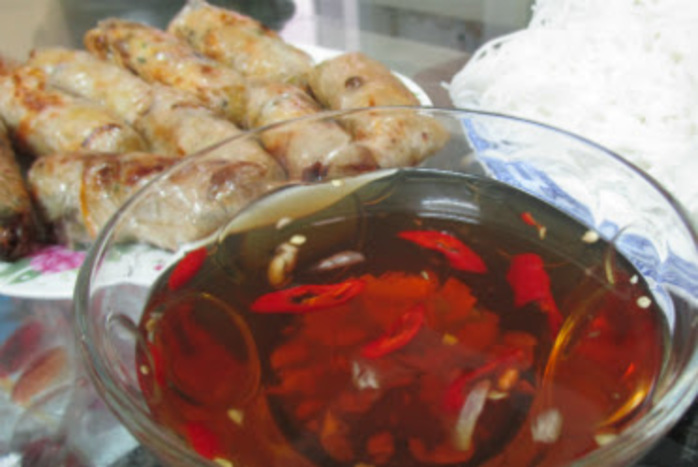 This Vietnamese style fried spring rolls recipe is one very popular in northern Vietnam. While I used pork in this recipe, you can easily replace it with seafood or other alternatives to suit your taste. Finely chop the herbs and julienne the carrot. Clean the wood ear and shiitake mushrooms. If you buy dried mushrooms, soak them in warm water before slicing them into fine pieces. Soak the dried glass noodles in water to soften and cut into 3 -5 cm lengths. Finely chop the jicama. Mix these prepared ingredients with minced pork in a bowl. Add salt and ground pepper. Mix well and marinate for 10 minutes. Add an egg to the mix and stir. If the texture is too dry, add another egg, but make sure it's not watery. The right texture should be soft and a bit sticky, with all ingredients mixed together. Prepare the rice papers: if the rice papers are too dry, rinse quickly in water mixed with 1 tsp of sugar and vinegar. Be careful not to let the rice papers get too wet and sticky. 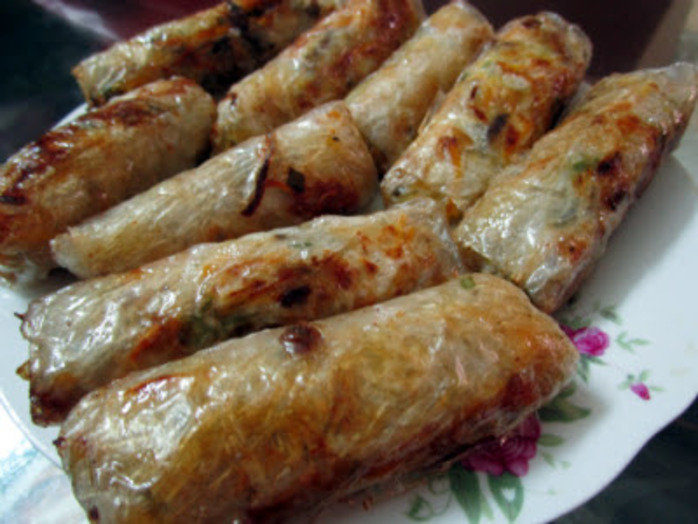 Put 1-2 tbsp of stuffing into a rice paper and start to fold it into a spring roll. Don't fold too tight as it might break, but keep it tight enough so that the stuffing stays in place. Pour some cooking oil in a frying pan, boil over high heat. 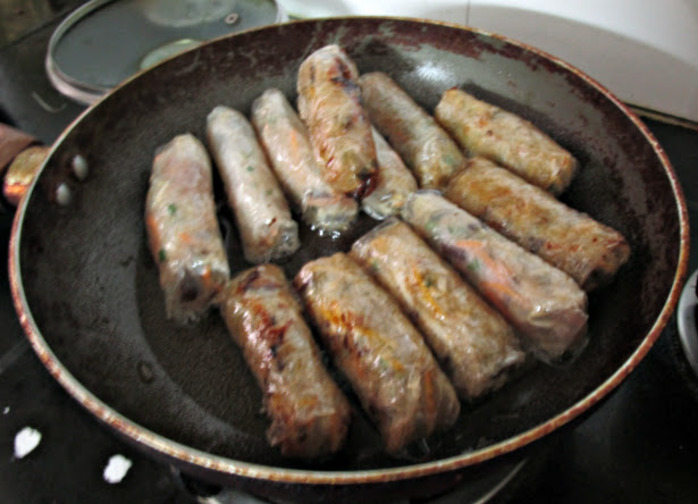 When the oil is boiling, start to fry the spring rolls. When the rolls turn golden and the rice papers feel crunchy, take the rolls out and leave to cool. 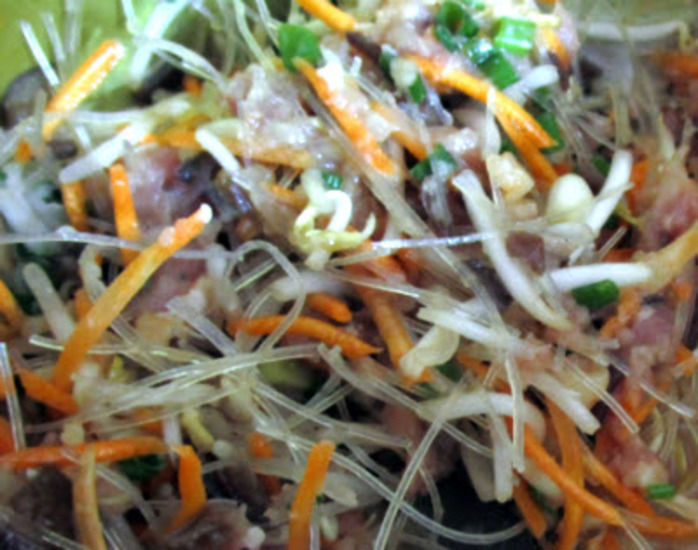 A good spring roll should have crunchy brown skin and soft juicy stuffings. Make the dipping sauce: Thinly slice the rest of the carrot and kohlrabi, soak in vinegar. In a small bowl, add sugar, vinegar, fish sauce and water with a ratio of 1:1:1:4. You can adjust a little to suit your taste. Smash the garlic, and finely chop the chili. Rinse the carrot and kohlrabi and dry. Add them to the bowl of dipping sauce and stir well. Serve the spring rolls on a plate with a bowl of dipping sauce.